Blog Can You Grow Plants Without Sunlight? Elementary-aged students all over the world learn about plants every year and what they need to grow. It may be one of the first scientific formulas we learn as we begin to wander out and explore our world. Seeds + soil + water + sunlight = growing plants. Our awe of the sun grows as we study our solar system and the way the sun has such a profound effect upon our world. In all those years of childhood, few of us ever stopped to ask the question: Can you grow plants without sunlight? The answer is… Yes, you can indeed! Plants require light to make food for themselves, but it does not matter where the light originated. It only matters that it is the right kind of light. Your ceiling light or the lamp on your nightstand will probably not suffice, but there are special lights called “grow lights” that simulate sunlight so that plants can grow under their glow. There are many types of grow lights, and you can get them from a variety of places, so it is important to weigh your options with them. The opportunity of simulated sunlight, however, opens up the possibility of growing plants indoors, all year long. What Are The Best Types Of Lights To Grow Plants Without Sunlight? There are basically three main types of grow lights you can use for your plants. HPS lights are some of the most powerful, and most expensive grow lights you can get. They emit a lot of heat but can put out 1000 watts of simulated sunlight for your plants. They can be purchased with particular stands, tents, and other extra apparatus for those who have grown beyond a handful of houseplants and are setting their sights at creating their own Greenhouse, either in an exterior building or perhaps a large basement area. They are not recommended for spaces where non-gardeners, such as children or pets may be running through due to the significant heat they produce which could be a safety hazard. 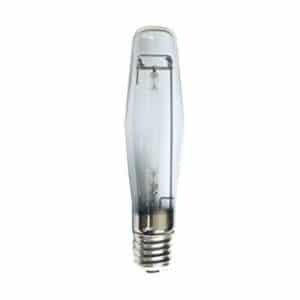 Fluorescent lights are cheaper, and although less potent than many of the HPS lights, are in many ways more practical. Since the bulbs are long and thin, they can be readily utilized in shelf areas. They also run cooler than HPS lights, meaning they will be less of a fire hazard and require less ventilation in your gardening space. The major downside to fluorescent lights is that they have chemicals in them, so if they break, you may have more than glass to clean up. You may have to deal with chemical residues. LED lights are the safest and most easily adapted to grow plants without sunlight. They give off very little heat, and if you desire to change the color of light emitted, they are far easier to change than fluorescent or HPS lights. The downsides are their cost, and that sometimes they do not fit in stackable shelf areas as well as fluorescent lights do. How much experience do you have gardening in general and indoor gardening specifically? How many plants do you have and how many do you hope to have soon? How much space do you have for these plants and how will they be arranged? How close will these plants be to the light? Who else will have access to the area that you will be keeping your plants? If you have ample space and lots of money (and if you are a more experienced indoor gardener), then HPS lights might be your best option. If you have limited shelf-like space, fluorescent lights might work best for you as you grow plants without sunlight. It is essential to note how close the lights will be to the plants. HPS lights emit a lot of heat. If they are too close to the plants, they may get burned. Fluorescent lights are cooler than HPS lights, but they give off a little heat. If you live in a less temperate climate, you may want to use this heat to your advantage and save a little on your heating bill. LED lights give off very little heat by comparison which is not helpful in cold climates, but in most others provides less environmental effect upon your plant area. This gives them a broader appeal. In general, if you can afford them, LED lights tend to be a better buy for the majority of situations. Yes. LED lights work quite well, especially for smaller groups of plants. For larger groups, you may need something more powerful, like an HPS light, but LED lights make excellent grow lights for novice indoor gardeners working to grow plants without sunlight. One of the unique benefits of LED lights is that they are more easily swapped out for different colored bulbs. The color of light, or rather the wavelength, makes a significant difference on the plant. Red lights encourage plant budding and blooming, while blue lights help them store their energy in the vegetable components. This means that flowers and “fruit” type vegetables, tomatoes, cucumbers, squash, and others that have seeds within them favor red lights, while “root” vegetables, like potatoes, carrots, and radishes favor blue lights. Additionally, more advanced gardeners can use the colored LED lights to create unique colors, textures, and tastes in their plants. Not usually. LED technology is very customizable, and every bulb is different. What plants require are bulbs that produce the exact red and blue wavelengths that they get from natural sunlight. Fortunately, there are plant-specific LED grow lights you can purchase, which only produce the wavelengths used by plants. Why is that helpful? If your light uses a lot of wattage (and your electricity) emitting green and yellow colored wavelengths, that light is wasted, because the plant cannot absorb it. These specialty LED grow lights give your plants exactly what they need and do not waste energy or your money doing their job. The upfront cost is not cheap, though. 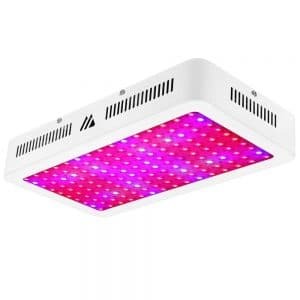 A small 19x5x3 LED grow light may cost you over $200. There are a few quality, less expensive LED plant lights on the market. How Much Direct Light Do Houseplants Need? Plants need between 14-18 hours of light per day to stay healthy, growing, and producing the fruit and flowers you want from them. In most places, this means they are seasonal. Summertime gives most plants enough light if they are situated close enough to a window with good sunlight access. Even then it can be problematic because east facing windows receive good light in the morning and poor light in the afternoon/evenings. West facing windows are the opposite. South facing windows will get a more extended opportunity to receive light. This is why many greenhouses are built with transparent walls and roofs, to maximize the available light for the growing plants. How do you set up your plants so that they receive the light they need? Let’s look at two examples based on different abilities to access sunlight. If you have access to an east-facing window and your plants are small enough to sit close enough to receive direct sunlight, you can probably count on somewhere between 4-6 hours of good direct sunlight. You might get a another 6-8 of indirect sunlight when the sun starts to sink into the western horizon in the afternoon. It is important to remember that this light will probably be adequate for your plants to survive, but they may not be enough light to produce good fruit or flowers. When the winter months hit, some plants may not receive enough light and will either die or go into hibernation until late spring. You should plan to use the grow light for up to 16 hours each day, and then subtract the amount of direct sunlight they get in the window. You should set your grow light to turn on when the plants are no longer in direct sunlight and stay on until the plants have had at least 16 hours of good quality light. In the example of an east facing window, you may find that direct sunlight leaves your east facing window at noon. You could set your grow light to come on between noon and midnight, to ensure they get sufficient light to grow to their full capacity. By utilising the natural sunlight for part of the day, you several hours of electricity per day during the winter, and perhaps more in the summer. 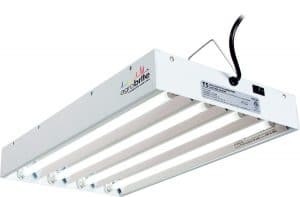 If you are growing your plants in an unlit room, or perhaps have a larger indoor garden that cannot fit in front of a window, you will need to plan on using your grow light full time. 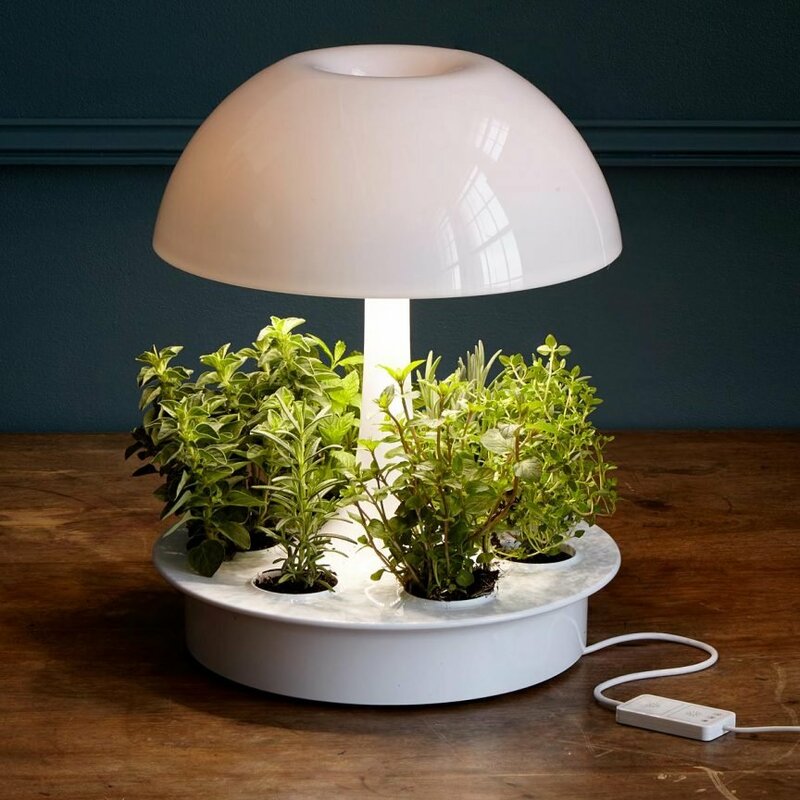 This model is for those who genuinely want to grow plants without sunlight. For many of these indoor gardens, the light is not the primary challenge. The more significant issues they face are temperature and ventilation. Plants will not grow if the temperature is too hot or too cold, and those temperature ranges vary depending upon what kind of plant you are growing. If you are keeping them outside of your regular living space, you need to be sure to keep your plants at a moderate temperature of 65° to 75°F (18° to 24°C). This will keep your plants believing it is still spring and early summer and continue their growth. Your garden will need ventilation also. Still air and the moist environment of growing plants can be a breeding ground for plant diseases, which can result in poor growth or plant death. You may need to install ventilation equipment to ensure that your growing area provides an area which will meet the needs of your plants. Getting your plants light can actually be quite easy. They will need 16 hours of light per day. If they are seedlings, they also need those 8 hours of darkness. Since you are not influenced by the sun in this setting, the easiest way is to purchase your grow light and set it on a timer. That way, you can be confident that they are getting the right amount of light and not worry about turning things on and off or trying to move your plants from one location to another on a daily basis. Whether your plants have access to direct sunlight or not, a timer for your electrical outlet is an invaluable thing for you to have as an indoor gardener. It is not difficult to grow plants without sunlight, but it does take a little research, some organization, some rearrangement of indoor space, and a bit of financial investment. Here are a few parting tips to make sure you start well. Decide what kind of plants you want first. Read up on their requirements for temperature, space, moisture, and airflow. Remember, not all plants are the same. Set up your indoor gardening area as a specialized area of the house. Houseplants will not do as well in high-traffic areas, like busy living rooms or dining rooms. Small herb gardens may work well in kitchen windows, as long as they are not disturbed. If you have an unused basement space, consider using a grow light there so the plants can grow without the threat of being accidentally knocked over. Save up and get a better (more expensive) grow light rather than going for something quick and cheap. Some grow lights on the market do not actually give off the wattage as advertised. Many of these are foreign made in places with less quality control. For example, the King Plus 600w, which goes for about $90 actually only gives off 120w of light for your plants. I think it is safe to assume that you will probably be paying somewhere around $1/watt of light with your grow light. Save and spend accordingly.